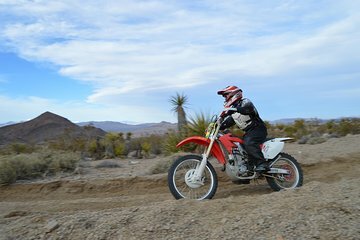 Hit the trails on this radical dirt bike tour in the desert landscape of Primm and the Hidden Valley. Get stoked for an intense but thrilling ride through the rugged mountain terrain of the Nevada desert. A comfortable, air-conditioned ride takes you about 30 minutes outside of Las Vegas and into the wilds of Nevada’s desert. Upon arrival, a brief but comprehensive safety discussion prepares you for the adventure ahead. After that, you’re ready for a memorable off-road experience through the Hidden Valley, McCullough Mountain Range and Roach Dry Lake. Your extreme dirt bike adventure will lead you down a mix of single and dual-track trails. Get ready for the thrills of challenging terrain, spectacular mountain scenery and dynamic off-road racetrack. Depending on group size and riding experience, you’ll explore between 20 and 50 miles of breathtaking desert landscape. Enjoy a relaxing lunch break at Primm’s unique Buffalo Bill’s Hotel and Casino on the Nevada-California state line. After the break, you’ll be refreshed and ready for the return leg of your dirt bike ride. As this is a challenging adventure, you must have prior dirt bike riding experience to join this tour. Fantastic fun day of desert riding! The entire staff is excellent. Our guide Bryce was outstanding. I had a great ride. Got to experience desert riding for the first time. Glad i booked the trip. Great set up, nice great route. Our guide, Bryce, was on it! Thanks you guys! I had an amazing ride! Outstanding dirt bike tour. My guide, Dan, was awesome. Will def do this again! I have mixed feelings about this tour. First, the company that facilitated my booking of this Viator doesnt know much about motorcycles or what happens. They also dont let you contact the tour company directly American Adventure Tours to ask questions about bikes or gear. Anytime you call to ask a question you are placed on hold while someone at a call center calls the tour company. Being a lighter rider 511/135lbs and considering myself more of a novice with some off-road experience I specifically asked for the lighter KTM 300 XC-W. I showed up and was given a bike that was not even on the list of options, a Frankenstein Kawasaki 450 that was 3 years old pieced together with bald tires and no electric start. There were no other motorcycle riders this tour and about a dozen other folks on ATVs and Razors. So it was just the guide and I. I RECOMMED TAKING PHOTOS OF THE BIKE YOU RIDE AT ALL ANGLES BEFORE GETTING ON IT. More on this later. Not much of a briefing. Now that I am finished with the tour I can tell you it was in 3 parts: up a technical section with whoops and single-track up to a radio tower lookout. Part 2, back down that section and across a dry lakebed to an outlet mall parking lot in Primm, NV 20 minute lunch break with opportunity to hit the food court. Last section was back across the lakebed and through another flat technical section of single track to the vans. I dropped the 450 a few times on the technical sections. It was too big of a machine for the technical sections for me and the small wipeouts were 100 my fault. Kick starting the bike on uneven terrain was difficult and happened no less than 20 times. The bikes idle was set too low and the bike stalled anytime you let the throttle go to idle. The guide adjusted after I stalled out several times. Fantastic tour! Highy recommend going on it! Very well organised and being able to go at whatever speed you are comfortable at is great. If i'm even back in Vegas again i will definitely be doing this again!! First-off, Kyle is a Rockstar! Been riding motocross over 20 years and this ride was epic. Bring the Boys from North of the border back soon and we will be riding, hopefully with Kyle. This was the best part of my Vegas trip and I'll be doing it everytime! I would definitely recommend this tour because it was at the time new, challenging and fun. The instructor gave me helpful advice as how to handle different terrains along the tour. By the end of the journey i felt like i had gained great confidence an knowledge on how to handle desert roads.